8am - 5pm Race Village Open - Race Boats on Display -Truman Waterfront– End of Southard St.
4pm - Boat Parade - Duval St.
8:30am MANDATORY DRIVERS MEETING – Key West Marriott Beachside Hotel - 3841 N. Roosevelt Blvd. 11am - 3:30pm Water test /Dunkers: FL Keys Community College Pool -5901 College Rd. 10am - 2pm Water test /Dunkers: FL Keys Community College Pool -5901 College Rd. 7pm – 9pm Awards Presentation: Key West Marriott Beachside Hotel, 3841 N. Roosevelt Blvd. Dubai: Victory Team ace Salem Al Adidi is confident his side have invested enough to ensure a favourable result at the season-ending Key West World Championships in the United States next month. Al Adidi, who teamed up with the experienced Gary Ballough at last weekend’s Super Boat International (SBI) in Clearwater, will be back alongside fellow Class 1 world champion Eisa Al Ali for the season finale – the Key West World Championships – from November 4-11. “The race last week [in Clearwater] was a great shakedown for us. Not only did we want to know where we stood as a team but we were also keen on making a winning North American debut,” Al Adidi told Gulf News after his return from the US. “We were competitive and we actually had the opportunity to be on the podium in our very first race in North America. To all of us in the team, that result is a consoling thought and we are right now in a position to build on this when we head to Key West,” he added. Participating in the penultimate round in Clearwater, Victory Team’s Al Adidi and Ballough in Victory 3 were chasing down DF Young and a third place finish when a stray swimmer forced the midway cancellation of the race. “We were right there to make a move for a podium spot, and all we needed was a few more laps to make that happen. But then the swimmer decided to intervene and we lost a good opportunity to put the Victory Team right up there,” Al Adidi recounted. “We were in a position to even lead at the start of the race, but we didn’t have the adequate power to take on main challengers like Miss Geico and Wake Effects. In all probability, we will be in a better position to get the most out of our package when we race in Key West. The race in Clearwater was a bit of a challenge for us considering that we had less horse power on our engines. But this aspect will be sorted out and we hope to be at the top in the final round,” he added. As per prevailing regulations, engine power of boats should not exceed 3,500 horse power (hp). However, from the 2019 season all boats will be required to cut down and keep their engines to a maximum of 2,200hp. “We managed to stick around with the big boats despite limitations. I feel we will be much better once everyone lands in Key West for the finale,” he confided. “This is the first time-ever that Victory Team is participating in North America, and it is our focus to ensure we fly the UAE flag there. I can sense that we can take that next decisive step where we will be able to consolidate on the positives and end at the top of the podium,” Al Adidi added. Though the series is yet to receive a formal endorsement from world governing body UIM, the Super Boat International (SBI) Championship is the leading North American professional powerboat organisation for Class One powerboats that was founded by John Carbonell nearly three decades ago. This season’s SBI campaign commenced in Cocoa Beach (May 18-20) before heading off to Michigan City in the first week of August and last weekend’s penultimate round in Clearwater. “It will be an all-out assault for the top spot in Key West,” Al Adidi shrugged. “We have nothing to lose really, and everything to gain. Our ultimate aim is to ensure Dubai and the UAE shines bright wherever we travel,” he affirmed. Dubai: Dubai’s Victory Team will be looking to build on their debut success as they prepare for a serious assault for top honours at the 38th Annual Super Boat International (SBI) Key West World Championships to be held from November 4 to 11. 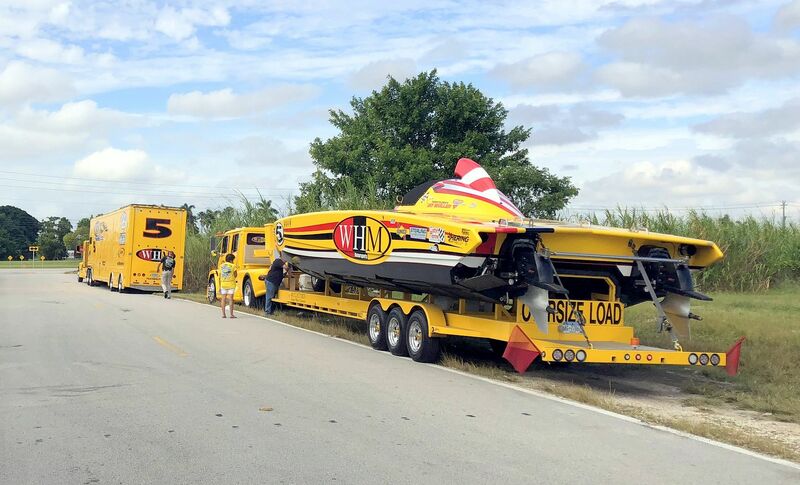 The team has already shipped off Victory 3 and Victory 33 to Florida and the support crew landed in the US to get the boats ready for the three races to be contested in the Superboat Unlimited class on November 7, 9 and 11. The races are scheduled at 10am, 12.30pm, 1.30pm and 2.30pm on all three days of the competition. A portion of the challenging 4.5-mile course runs through Key West Harbour where drivers will be able to touch high speeds of more than 225km/h due to the calm waters. The two boats were challenging for a spot on the podium during Victory’s debut at the SBI held in Clearwater, Florida, in the last week of September. But an overenthusiastic swimmer strayed onto the course and the race had to be called off. “As a professional team, we learnt from that first experience. Now it is time to build up on that and see where we really stand in the world of Class One powerboating,” Huraiz Bin Huraiz, Chairman of the Board of Directors at Victory Team told Gulf News. “Nothing changes on our objectives this week as we will be doing everything possible to ensure we land with at least a podium,” he added. The Key West World Championships are scheduled to kick off at 4pm (midnight UAE) on November 4 with a parade of race boats down the island’s historic Duval Street. Spearheading the Victory Team challenge during the week will be reigning Class 1 world champions Salem Al Adidi and Eisa Al Ali alongside John Tomilson [in Victory 33] and multiple world champion Steve Curtis [in Victory 3]. Held for more than three decades now, the SBI Championship is considered one of the most dangerous yet challenging races for dual-engine powerboats. And with just two operative rules — the boat length has to be from 42 to 50 feet and the engine power must match or exceed 1,500hp — Victory Team’s two boats will have their task cut out during the week. The Victory Team boats will be the only two without any modifications done as the SBI series is eyeing a major overhaul of rules starting next season. “I think we have the perfect package for racing in this series with the new rules coming in play from next year,” Bin Huraiz said. “Next year, the engine power will be limited to 1100hp per engine or 2200hp overall for all boats and we will go into the season with a distinct advantage. But right now it is about this race and we are confident our duo of Emirati world champions will do well alongside world-class drivers like Steve [Curtis] and John [Tomilson],” he added. KEY WEST, Fla. (AP) — One of the world’s most accomplished offshore powerboat racers is hoping to earn two more world titles this week at the Key West World Championships in the Florida Keys. John Tomlinson of Miami has amassed 46 national and world titles in his 32-year career. In Key West, he plans to race two different boats during separate races scheduled for Wednesday, Friday and Sunday. In the Superboat class, Tomlinson is teamed with Myrick Coil of Osage Beach, Missouri, in Performance Boat Center. In the Superboat Unlimited-class race, he plans to throttle Victory, piloted by Salem Ali Aladidi of Dubai, United Arab Emirates. Wednesday’s and Friday’s races account for 50 percent of accumulated points. Sunday’s final races, worth the remaining 50 percent, determine world champions. About 40 boats have registered for the Florida Keys event. Dubai: Victory Team’s Class One World Champion driver Salem Al Adidi has promised an all-out attack for top honours at this weekend’s 38th Annual Super Boat International (SBI) Key West World Championships from November 4 to 11. Participating in the Superboat Unlimited class, Al Adidi will team up with John Tomilson in Victory 33, while the second Emirati world champion Eisa Al Ali will be alongside multiple world champion Steve Curtis in Victory 3. Racing in the Superboat Unlimited class will be held at 2.30pm [10.30pm UAE] on all three days of the competition on November 7, 9 and 11 and Al Adidi is ready to take on the best drivers from across the world. “By any measure this will be the biggest race weekend for all of us. Three races spread over a week is not something that we have put our boats through at any given time. So not only is this going to be a new experience for our team, but it will also bring out the best from us,” Al Adidi told Gulf News from Florida. “Whatever the challenge before us, our goals and motives will not change for making this trans-Atlantic trip for the first time in the history of Victory Team. We want to make a mark in the US,” he added. The two-boat set-up may not exactly have a smooth going at Key West due to existing rules that allow boats to have as much as 2,000hp on each of its two engines, making Victory Team’s Lamborghini V12s [with a capacity of 1,100hp each] may not be competitive enough. “Promising to finish at the top of the standings may not exactly be a flattering prospect for our team as we would start with a disadvantage. But we will try our best to chase down the top boats and see what best we can do this season,” Al Adidi said. However, all boats will have to adhere to a level-playing field from the start of the 2019 season with engine capacity not to exceed 1,100hp. “Economically it didn’t make any sense changing the engines this year. But next year we will be in a much better position as we will be starting off with an advantage regarding the pros and cons of our current engines,” he narrated. “If something does happen to the engines then we can work out solutions well in advance and get ready for the new season rightaway. And for certain, we will be trying to be at our best when we go out on the course this week,” he added. The Key West World Championships are scheduled to kick off at 4pm (12 midnight UAE) on November 4 with a parade of race boats down the island’s historic Duval Street. A portion of the challenging 4.5 mile per lap course runs through Key West Harbour where drivers will be able to touch high speeds of more than 225kph due to the smooth water. They sure have the camera in a terrible location. I don't know why it's not up high. KEY WEST, Fla. (AP) — Offshore powerboat team Wake Effects has taken the lead in the Superboat Unlimited class after the first race day at the Key West World Championship in the Florida Keys. Driver Rusty Rahm of Olathe, Kansas, and throttleman Jeff Harris of Greenville, North Carolina, took a first-lap lead and maintained it throughout Wednesday’s race, outpacing rivals including two Victory Team boats from Dubai. Victory 33, throttled by Miami’s John Tomlinson and driven by Salem Ali Aladidi of Dubai, ended the day in second place. Leading the Superboat class is M Con, driven by Tyson Garvin of Joplin, Missouri, and throttled by Tyler Miller of Wathena, Kansas. Competitors in the 39-boat fleet, divided into seven classes, are racing again Friday, and then on Sunday with the world championship title on the line. Dubai: The chairman of the board of directors for Victory is confident the team is capable of landing bigger prizes going into the penultimate round of racing at the 38th Annual Key West World Championships held in Key West, Florida, held in the early hours of Thursday. The two Victory Team boats were among the main challengers throughout to leader and ultimate winner Wake Effects to land second and third places in the seven-lap race of the Super Boat Unlimited category at Key West. Thrown into a jumble of a dozen boats at the start, the two Victory Team boats were slow to take off as Wake Effects headed towards a clear lead early in the race. But the Victory Team duo chased down Wake Effects to ultimately finish 20 seconds behind the champion from the USA. Participating in the Superboat Unlimited category, Salem Al Adidi teamed up with John Tomilson to bring in Victory 33 in second place as Eisa Al Ali and multiple world champion Steve Curtis in Victory 3 came in third to complete the podium standings. “This is simply such a brilliant performance from us,” Bin Huraiz told Gulf News after the race. “I never expected such a strong result from our boats. I think we have the necessary experience and the expertise to be even better for the next two races,” he confided. With a slow start to make up ground, the two Victory Team boats were among the early challengers along with Lucas Oil and Husky Chocolate. With a superior engine power backing them, Wake Effects maintained its lead even as the two Victory Team boats gradually started gaining on the leader. “I think we have many reasons to feel happy today,” Bin Huraiz said. The two-boat set-up was not expected to have a smooth going at Key West due to existing rules that allow boats to have as much as 2,000hp on each of its two engines. This rule handed out a distinct disadvantage to the Victory Team’s Lamborghini V12s that have an existing capacity of only 1,100hp per engine. “We were not only competitive. We were consistent throughout the seven laps of the race. This shows stability in the set-up and the hard work put in by our dedicated Victory Team crew,” he complimented. The racecourse consisted of a challenging 4.5 mile lap running through Key West Harbour and at times even touching high speeds of more than 225kph due to the smooth water on the outside. The next racing day for all four categories in the championships is November 9 with the Superboat Unlimited class going through its seven-lap contest from 11.30pm UAE time. November 11 will be the third and final day for the championships. KEY WEST, Fla. — Powerboat racers John Tomlinson and Salem Al Adidi have piloted Victory 33 to a Superboat Unlimited-class lead on the second race day of the Key West World Championship series. Tomlinson of Miami and Al Adidi of Dubai began Friday’s race in second place but took the lead halfway through the 9.75-lap challenge and never relinquished it. Tomlinson has amassed 46 national and world titles in his 32-year career. AMH Motorsports, driven by Aaron Hope of Groveland, Florida, and throttled by Anthony Smith of Brick, New Jersey, garnered the lead in the Superboat class. Racing concludes Sunday for 39 registered boats divided into seven classes. I guess they didn't get the news. Key West, Florida: Dubai’s Victory Team proved their true worth as UIM world champions when they claimed the top two spots in the penultimate day of racing at the 38th Annual Key West World Championships in Key West, Florida, on Saturday. Going into the second of three races of the Super Boat Unlimited category at the season-finale week, the Victory 33 boat of Salem Al Adidi and John Tomlinson took the chequered flag ahead of teammates Eisa Al Ali and Steve Curtis in Victory 3. Wake Effects, the outright winner of the opening race last Wednesday, could not start the race due to a technical issue and within no time it was the Victory Team pairing of Victory 3 and Victory 33 taking over at the top. Reigning Class One World Champion Al Ali and former multiple world champion Curtis were at their best leading their stablemates. However, with one lap remaining it was Al Adidi and Tomlinson making a move for the top spot to clinch maximum points to head to the top in the overall standings to determine the world championship after Sunday’s third and final race. Victory 33 had gone into the second race with a distinct advantage after having come in second in Wednesday’s first race. Victory 3, which had finished third two days ago, climbed up one spot and are now second in the overall standings ahead of Wake Effects. The racecourse for the week consists of a challenging 72km lap running through Key West Harbour, which at times sees the boats touching high speeds of more than 225km/h due to the smooth water on the outside. “Amazing! That’s all I can say at this moment,” Huraiz Bin Huraiz, chairman of the Board of Directors for Victory Team, told a group of journalists after the race. “Our strategy was to push as much as we can so that we can prove the reliability of our engine package. And that’s exactly what has happened this week as our smaller engines have proven to be much better than the rest. I am confident that our boys will go out there on Sunday and get the job done to ensure Victory Team stays as the number one racing unit in the world of powerboat racing,” he added.